Steiff Baerle 28 PB 1905 Replica Discounts Apply ! Made from The Finest White Mohair . Imagine their surprise! When a couple of antique enthusiasts from the U.S. bought a vintage chest of drawers, they got much more than they bargained for. Tucked away inside, carefully wrapped in an old cotton bed sheet, the pair discovered quite a treasure: a rare Steiff Teddy bear! Hidden away for decades, their valuable find had been produced in 1905 and was among the earliest of Steiff bears. Now more than a century old, his white fur was slightly yellowed and his limbs were wobbly, but his wooden eyes had lost none of their luster. For 2014, we're pleased to give Steiff lovers everywhere a chance to share in this remarkable discovery. We proudly present our "Baerle 28 PAB" replica 1905 based on the ground-breaking Richard Steiff design. From the top of his mohair head to the carded soles of his feet, the bear has been lovingly recreated to capture all the charm and appeal of the vintage original. No Steiff collection would be complete without it. with Wooden eyes 5-way jointed, head and arms are loosely attached to the body, Squeeker and stuffed with wood shavings and kapok with "underscored button" made of patinated steel in ear and Surface Washable. 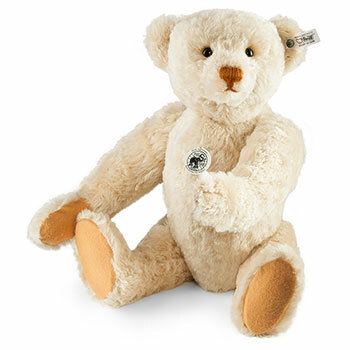 This Bear is part of Steiff's 2014 Exclusive range.